The 7-Day Slim Down is a program focusing on the role of vitamin D in weight loss and health. It was created by Alisa Bowman – a New York Times bestselling author – with the editors of Women’s Health. This plan is designed as a long-term approach to healthy weight loss. 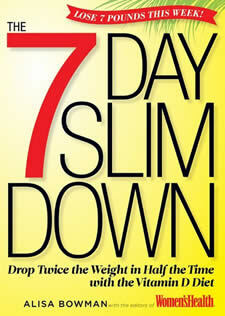 However, it was called “The 7-Day Slim Down” because dieters experience dramatic weight loss during the first week. These initial results provide great motivation to stick with the remainder of the program. This book highlights research that 70 percent of Americans are deficient in vitamin D and almost 70 percent are overweight. However you can lose belly fat and almost double your rate of weight loss simply by maximizing your vitamin D status. Vitamin D has beneficial effect on weight loss because it influences your natural ability to burn fat. It also helps control your appetite and prevent cravings that can lead to overeating. But as people gain weight, their fat traps vitamin D, so it cannot be used for important functions in the body. The first phase of the program is a one-week jumpstart diet to help you quickly drop excess pounds. You will follow set menus that provide 1400 calories a day and at least 1000 iu of vitamin D.
You can start the program with this plan or go straight to the next phase if you would rather have a less-intense option. The next phase of the program offers more flexibility to help you learn new eating habits that you can maintain for a lifetime. There are no set daily menus and you are encouraged to create a personalized plan from the options provided. It is still necessary to monitor your portion sizes and watch your calories. Nevertheless you will have the opportunity to eat out and enjoy your choice of snacks or a glass of wine on occasion. The program highlights foods rich in vitamin D and other nutrients that promote fat loss. They include fatty fish (such as wild salmon), D fortified dairy products, eggs, mushrooms, whole grain bread, tofu, orange juice, and breakfast cereal. Salmon, tilapia, shrimp, turkey, chicken breast, eggs, low-fat cheese, tofu, D-fortified fat-free milk, D-fortified orange juice, berries, apples, whole grain bread, brown rice, lettuce, mushrooms, broccoli, cauliflower, kale, tomato, cucumber, alfalfa sprouts, avocado, almonds, pistachios, hummus, mustard, olive oil, dark chocolate, green tea. The book includes photographs of strength training exercises. The best exercise is one you can do outdoors because your skin produces vitamin D from sunlight. The 7-Day Slim Down: Drop Twice the Weight in Half the Time with the Vitamin D Diet retails at $25.99. Highlights the role of vitamin D in weight loss and health. Includes seasonal menu plans and recipes. Provides a customizable exercise plan. Snacks, desserts and wine are permitted in moderation. The first 7-days requires strict adherence to the meal plan. Dieters may not enjoy all of the required foods such as fish and mushrooms. Some experts recommend a higher vitamin D intake than the amount provided in the meal plans. The 7-Day Slim Down is a diet plan highlighting the importance of vitamin D for weight loss and health. Weight loss on this program may be largely attributed to reducing calorie intake and increasing physical activity. However, maintaining adequate levels of vitamin D plays a supportive role by enhancing fat burning and promoting general well being. My doctor recommended 4000iu of vit d daily. In addition, I started getting more exercise outdoors and added kale and c wild caught salmon to my diet. In one month, I lost an inch off my waist and hips and dropped 4 lbs. My belly is flat like it was in my 40s! If you are having a hard time losing weight, this may be your answer!